Zelda Fitzgerald died 66 years ago to the day, in 1948. She had been a patient at Highland Mental Hospital in Asheville, North Carolina, off and on for nearly a dozen years. On March 10, fire spread through the hospital and burned nine women alive, including Zelda, who was on a locked ward awaiting electroshock treatment. As much for her turbulent lifestyle as for her horrific death, the wife of F. Scott Fitzgerald continues to serve as a tragic muse for contemporary novelists. 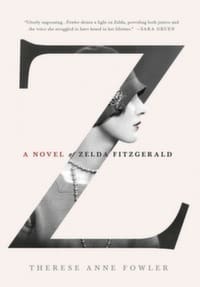 Z is terrific historical fiction, yet somehow, despite the intimacy of its first-person narration, I came away with no real feeling for Zelda’s inner life—and, crucially, no sense of her madness. Moreover, Fowler misses a trick with her choice of framing device: the novel begins in 1940, with Zelda back at her family home in Montgomery and about to receive the news of Scott’s death. Why not open, instead, with Zelda in the asylum? What a climactic, Jane Eyre-like moment that would be: the heroine caught in a fire, having flashbacks to her earlier life. Fowler also passed up an incredible opportunity by creating her own letters between Zelda and Scott, when there was in fact a trove of historical letters she could have referenced. Zelda made a number of other fictional appearances last year: in Erika Robuck’s Call Me Zelda, R. Clifton Spargo’s Beautiful Fools, and Lee Smith’s Guests on Earth (set at the Highland Hospital). Zelda’s own semiautobiographical novel, Save Me the Waltz, is still available from Vintage Classics, and the Fitzgeralds’ history informs two nonfiction studies also published last year: Judith Mackrell’s Flappers: Six Women of a Dangerous Generation, and Careless People: Murder, Mayhem and the Invention of The Great Gatsby, by Sarah Churchwell. Baz Luhrmann’s 2013 Gatsby film is another sign of our ongoing fascination with the Jazz Age—and with the simultaneous glamour and disaster the Fitzgeralds represent. Everything could be snarled all to hell under the surface as long as you didn’t let it crack through and didn’t speak its name, particularly not at cocktail hour, when everyone was very jolly and working hard to be that way and to show how perfectly good life could be if you were lucky as we were. Just have your drink, then, and another and don’t spoil it. “Papa’s” various liaisons have also been explored in Hemingway’s Girl (2012) by Erika Robuck, set in Depression-era Key West, and Mrs. Hemingway, coming in May from Naomi Wood, which expands on McLain’s material through sections covering all four Hemingway marriages. In an April 2013 article for London’s Sunday Times entitled “The Real Mrs Fitzgerald,” journalist Patricia Nicol noted that these Fitzgerald- and Hemingway-themed novels seem to form “an emerging subgenre that takes a sideways look at the lives of great men by examining them from their wife’s or companion’s perspective.” Indeed, each of these books speaks to a conviction that the women have all too often been left out of the story – and it’s high time for novelists to, at least imaginatively, redress the balance.